Insurance policy clauses related to theft often include a condition that liability will only be accepted if there is evidence of violent and forcible entry, or words to that effect. Liability may be declined or an excess applied if such evidence is not apparent to claims investigators. On many occasions it is entirely obvious that a door (or window) has been forced open whilst locked but what if those obvious signs are absent? Clearly these circumstances may give rise to suspicions that the insured left the property insecure, that multiple keys exist, or indeed that the claim has been fabricated. In contrast, this article describes how, with the assistance of equipment that is now readily available and a minimum of practice, such suspicions may be unfounded in certain cases. I am neither a locksmith nor an amateur expert but before joining Burgoynes I spent 13 years as a Police crime scene examiner and I am thus familiar with questions relating to the security of buildings. Security and criminal techniques appear to evolve together, a step-change in the sophistication of one demanding a response from the other, and the lock manufacturing sector has already produced locks which are reported to preclude entry by the techniques discussed here. However, as in all things, economics are likely to play a part in the choices made by consumers, private or business, when addressing the physical security of a building. Clearly, there are some very sophisticated physical security systems on the market, but in each case, individuals are likely to make a choice based on their own perception of the risks and associated costs. It may be the case that an intuitive cost/benefit analysis will result in the least expensive system, sufficient to reassure the owner, being selected. In other situations, for example rented accommodation, the installation of expensive locks may not be high on a landlord’s list of priorities. It might thus be reasonable to suppose that a great number of properties are secured by locks that are of a minimum standard. In the author’s experience many domestic properties and flats are secured only with a rim cylinder latch (“Yale”-type) or in cases of many modern doors, a “Euro” lock. The term “lock picking” conjures up images of the clandestine application of a sliver of metal resulting in the miraculous opening of the door in a matter of seconds. So what is the reality? For many years specialist outlets have supplied locksmiths with purpose designed “picks” and lock by-passing tools of varying degrees of sophistication to assist in their work. With the advent of the Internet, such tools are now widely available, and as will be seen, some can be used successfully with only a modicum of skill and practice. 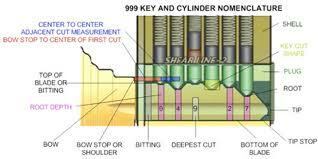 The method of operation of a cylinder rim lock: (See Diagram below) Insertion of the correct key makes the pins align with the “shear line” i.e. the gap between the cylinder (yellow) and the body of the lock (green). 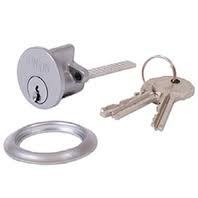 Once the alignment is achieved the key and the cylinder are free to turn and actuate the unlocking mechanism. Any other method that will cause the shear line to be unobstructed by the pins will also allow the lock to be opened. “Bump keys” work by elevating the lock pins by a small amount, and then striking the end of the key sharply whilst at the same time attempting to rotate the key. The jarring action causes vertical forces to be exerted on the pins which causes the upper set to “jump”. If all the upper pins jump past the shear line whilst the lower pins remain below it, the cylinder can be rotated. 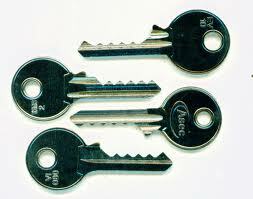 Standard bump keys, (also called “999 Keys”) represent a potential threat to premises secured with basic cylinder rim locks (“Yale” type locks). Depending on the style of bump key made (or purchased) they are also potentially capable of giving access to premises secured using Euro locks. Owing, in part, to the fact that most cylinder rim lock manufacturers adopt a common spacing of around 4.1mm between the pins inside the keyways on their locks, it has been estimated that up to 80% of these types of lock could be vulnerable to an attack of this kind. A test purchase of a set of six bump keys was made, which comprised three keys each for the differing key way profiles (“S” or “Z”). After study of tutorial videos from an internet source, selection of the appropriate key and use of the correct technique, it was found to be possible to open both a new cylinder rim lock from a DIY chain store and an old cylinder rim lock from a different manufacturer, with an estimated 50% likelihood of success within 30 seconds or so. In the earlier tests conducted, characteristic external abrasions to the lock were produced, but these could be eliminated using a slightly modified method. 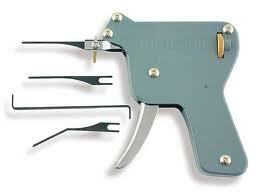 Moving up a level of sophistication, the “pick gun” can be viewed as a conveniently mechanised bump key. Success rates on 5-pin rim locks were found to be broadly in line with the bump key method, but seemed to improve slightly with practice. 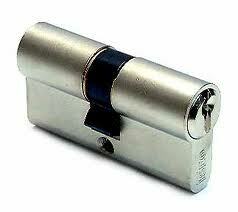 A 6-pin Euro-cylinder lock could also be opened although with a very much lower success rate. Many padlocks work with similar keys to rim locks, typically acting upon sprung triangular section “bolts” that engage in corresponding notches in the padlock shackle. “Shims” are available which are designed to be introduced into the gap between the shackle and the body of the padlock and then rotated to act directly upon the bolts. 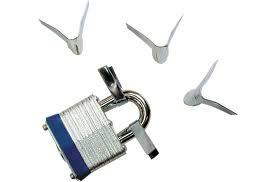 Of the three non-destructive methods of entry considered, these were found to be the most effective in terms of ease of use, a single demonstration being sufficient to enable almost anyone to successfully open a test padlock within around 30 seconds or so. The success of this method depends on there being sufficient clearance between the shackle and the body of the lock, to allow insertion of the shims. Some “weatherproof” padlocks (which incorporate rubber bushes on the shackle) might show signs of damage after an attack. Nevertheless, it seems likely that a sufficient number of outbuildings and sheds, which may contain valuable equipment could be vulnerable to attack from this method to make its use worthwhile. It has the further merit that its use is virtually silent, there being no more noise than would be made using an original key. Research has suggested that deadlocks can be picked and that appropriate tools are easy to obtain. However, the level of skill required greatly exceeds that needed to use the by-pass tools described above. This, together with the additional time required, mean that picking deadlocks is likely to remain unattractive as a method of entry in most situations. Therefore a door secured with a deadlock that has been by-passed, undamaged, without keys during the commission of a crime, might require further, very careful, consideration. Pick-guns, bump keys and padlock shims all represent potentially viable means of accessing locked premises without leaving obvious evidence of illegitimate entry. Absence of the usual signs of forced entry should not automatically lead to the assumption that keys have been poorly controlled, or that a report of an unauthorised entry is incorrect.